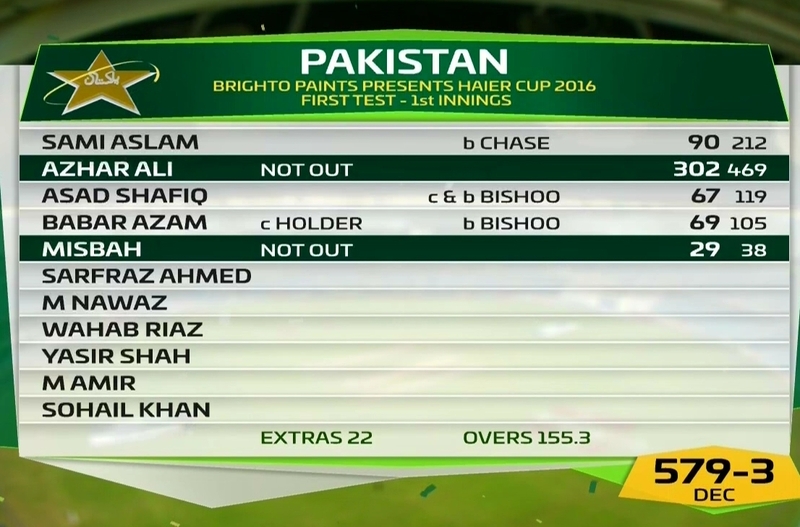 The ODI skipper Azhar smashed 302 runs as Pakistan declared their innings at 579. By doing so, the veteran became just the fourth Pakistani player to record triple century. Hanif Mohammad was the first player from his side to achieve this feat with 337 runs against the same opponents in Bridgetown in 1958. InzamamUlHaq jolted down 329 runs against New Zealand in Lahore in 2002 and Younis Khan recently accumulated 313 runs against Sri Lanka seven years ago in Karachi. The Caribbean side last faced a mammoth triple ton in 1958 also by a Pakistani player Hanif Mohammad. They haave also faced another triple ton by Andy Sandham in Kingston in 1929-30. 579 is the highest total Pakistan posted in United Arab Emirates. This is also the first 500 plus tally posted by the Greens in Dubai. Their previous best in the region was 570 for 6 which came against Australia in Abu Dhabi in 2014-15. AB de Villiers unbeaten knock of 278 was the previous best individual score in Tests in United Arab Emirates. Azhar Ali made his mark in the history book by becoming the first triple centurion in the region. AMonst Pakistan players, Shoaib Malik’s 245 against England at Sheikh Zayed Sports Complex was the best. 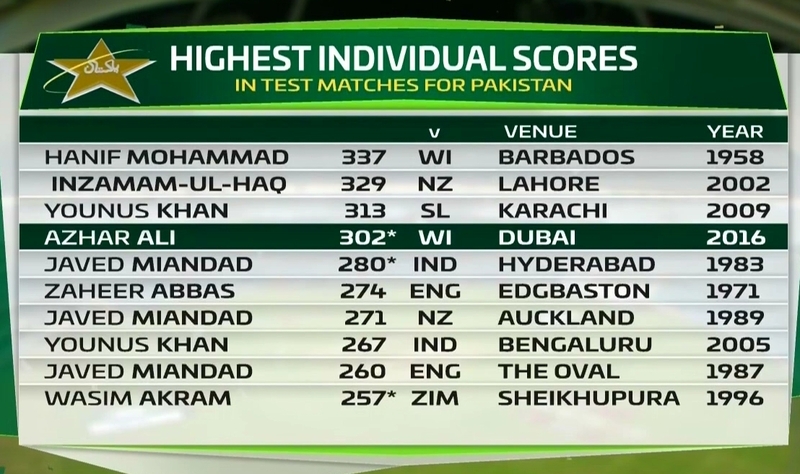 579 from Pakistan is the second highest score in a Test innings for them. The best innings score was 581 against India in Hyderabad in 1982-83. 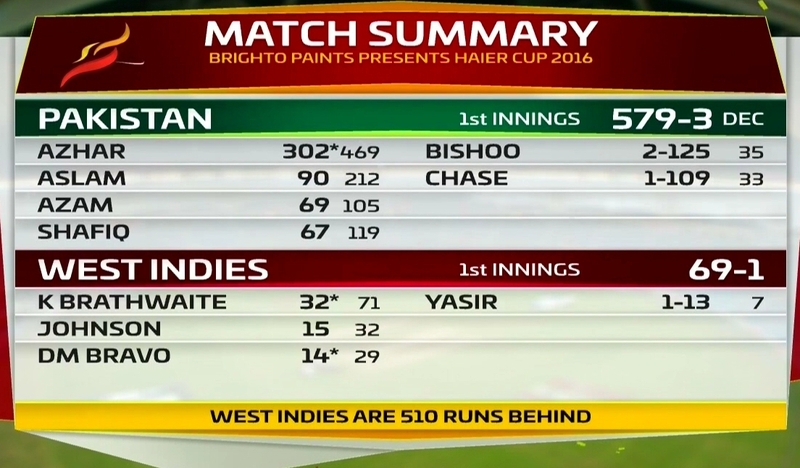 Pakistan recorded a century partnership for each of the opening three wickets in a Test innings. The Men in Greens have accomplished this feat four times with their last coming in 1992 at Old Trafford. Babar Azam brilliantly posted a half century on his Test debut while batting at number four. He became only the third player to do so. Saeed Ahmed jolted down 65 in 1957-58 and Saleem Malik cracked a century in 1981-82. The 31 year old Azhar was featuring in his 50th Test match. He managed to complete 4000 runs in this milestone. He is only the second player to accomplish this feat after Younis Khan.